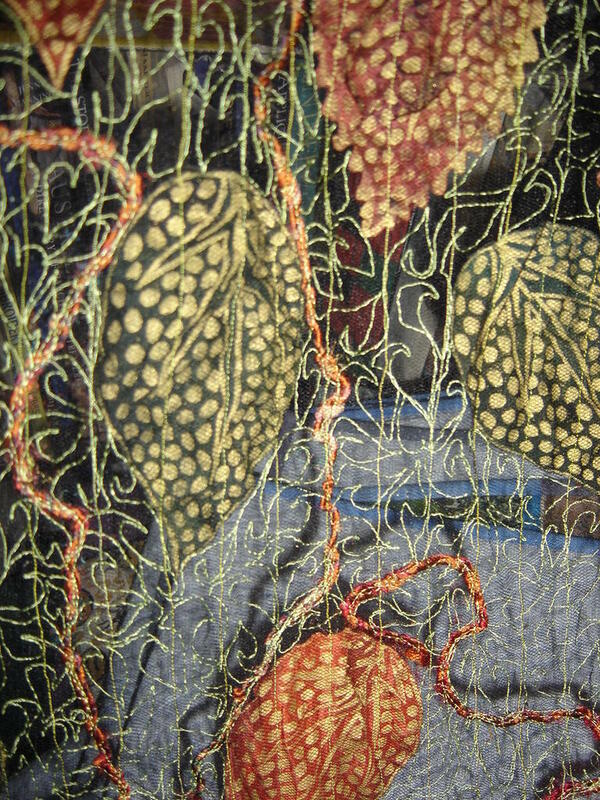 I have to deliver the leaf lace for exhibition on Friday but today as I looked at it I decided that I would overstitch the tulle- which took ages, Stopping it from puckering was a major headache, and last night in the middle of the night it suddenly dawned on me if I stabilised it with some wash away type vilene that I have it might work. It still puckered a little, and I wished I had used a different colured thread ( it is almost impossible to unpick sewing once it is on the tulle) but on the whole I think it looks better than it did before. Sandy or anyone else the ISP number is 86.133.204- if that means anything- it would be too funny if it was you! Ican hand deliver the quilt to you! Ok- there has been 20,000 plus visits- and no they weren't all me as I went out most of this afternoon but the 20,000th visitor has an ISP that is British Telecommunications in Suffolk, city Ipswich- that is all I know- they visited at around 3.40pm eastern standard time- so if this is you,please email me or contact me somehow- and I will be in touch. And I did work on the small quilt which is 23 inches long by 13 inches wide, but it is not finished yet - hence no pics yet.I had hoped to have had at least some pics. Better go and make that small quilt! Just a quick post- there are 48 visitors to go until there has been 20,000 visitors to my blog- so I had better go and make that small quilt I promised for the 20,000th visitor! And many thanks to everyone who visits! I also hope that all the people affected by Hurricane Katrina firstly survived and secondly can return safely to their homes soon. 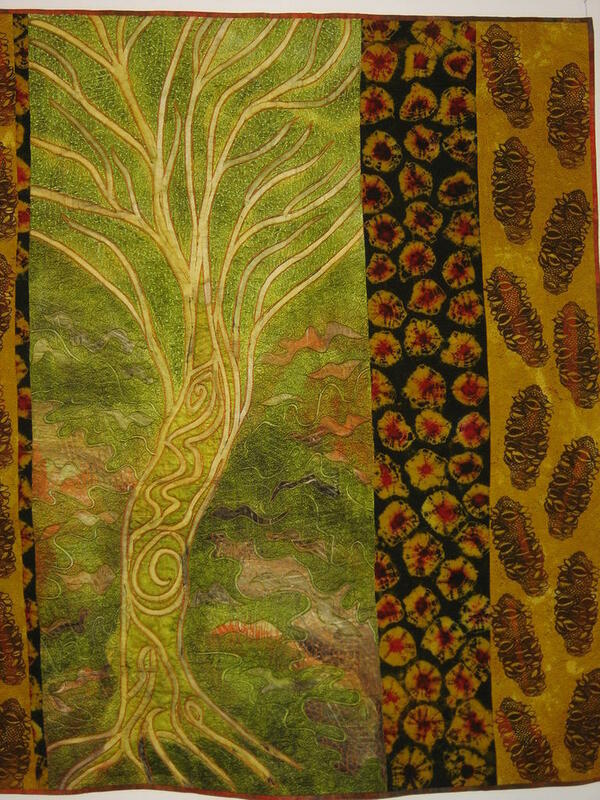 I discovered today I don't need to use Hello/Picassa to upload pictures intoBlogger- however I must admit I enjoy the easy tuning and cropping function of Picassa.I finished this Forest quilt today- it's called Forest VI -Otway -Late Afternoon. I think of all the Forest quilts I have done this is the most like the view from my workroom window on a late summer afternoon- all golden glow in the distance, dark standards in the foreground. I am trying to capture that feeling when you are all mellow , lying on the forest floor or a grassy bank (or sitting in my workroom dreaming), enjoying the sinking sun, and shadows play on your eyelids, and your imagination floats nowhere in particular but somehow you are content and happy. I feel like I have fallen off the radar the last couple of days as I left my laptop with the photographers whilst we were photographing Across Australia. Soaccessing the internet has been a bit of a problem. Anyway I did manage to finish my banksia quilt by Thursday- I ended up cutting away quite a lot og the green polyester film to reveal the hand painted background. 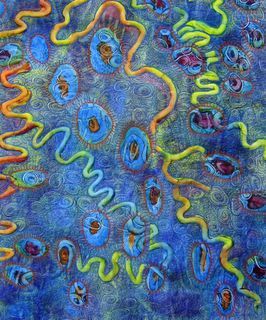 Some exciting work amongst the quilts for Across Australia and the exhibition will be quite different than the other two 'big'- as in more than 6 artists- exhibitions I have curated. It opens life at Quilt Indulgence from 8 September util 11 September. I fly to Europe on 13 September to teach at Val d'Argent. 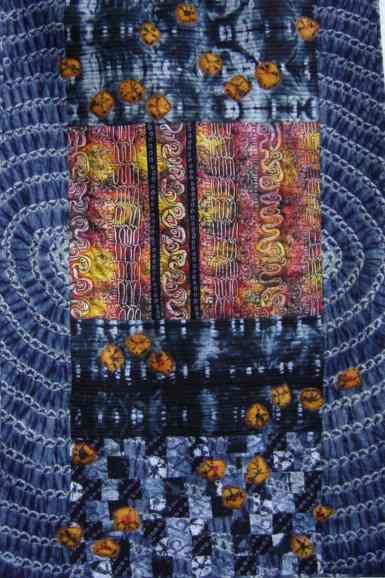 I am also teaching at Quilt Indulgence on the Thursday 8 Sept and Friday 9 Sept. Thank you to so many of you who took the time to respond to me and say so many lovely things about my work after my rejection whinge of the previous post,. 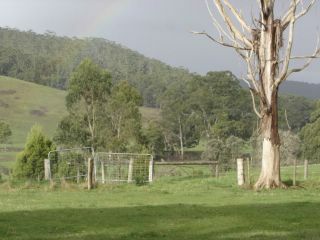 I Must admit the attraction of a steady income always looms on the horizon and larger still when a rejection comes in. 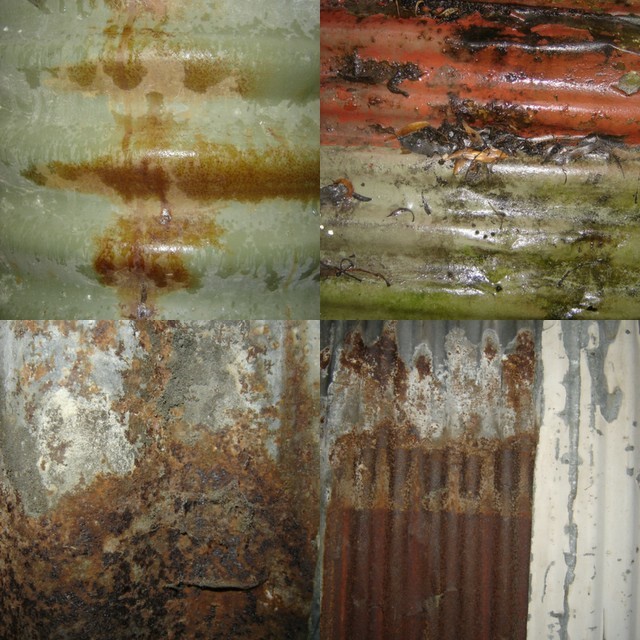 As Linda said a lot of my work is seen in invitationals- but somehow that is not the same as being juried into an exhibition- even though I am very grateful for such invitations and it is a wonderful opportunity for showing your work. I suppose what does roll around the back of my mind is the fact that somehow juries don't like the work but often quilt show organisers do( hence the invitationals) Which makes me wonder is there a difference in what juries look for and what quilt show organisers look for, and then how do these two things marry together? 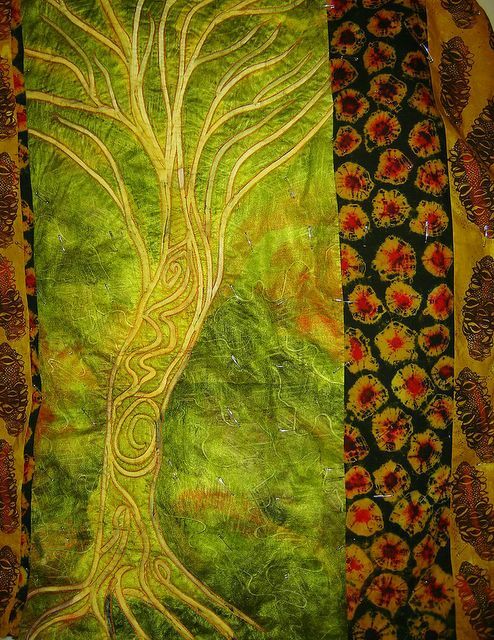 Anyway I seem to have walked off my rejection funk and am working on another forest quilt which I hope to finish this morning . We spent the weekend cooking, my eldest daughter and I , and we made a Chinese dinner last night for friends who came over for dinner- chicken and creamed corn soup, lemon chicken and fried rice, and vegetable stir-fry with tofu and our own asparagus , silver beet and carrots. 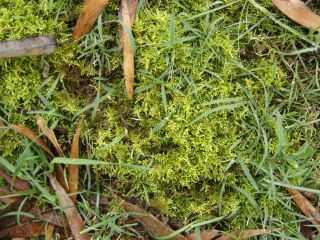 And the number of visits to the blog are getting quite close to 20,ooo- there is only about 200 to go. I know I have posted a picture of this quilt before but last week I got the reject letter from Rhythm and Blues , Val d'Argent for this quilt last week. I wished I had saved myself the entry fees, as this is yet another in a long list of rejects for exhibitions going back to about 1999. I am wondering why do I bother, because I can't pretend that it feels great to add yet another reject to the growing list. And each time you question yourself and the validity of the work you are doing. The trouble is when you teach you do have to show your work so that prospective students can see the work but if you get rejected then the work isn't shown . It is like a Catch 22 really. So what do I do with the quilt now?- it is a little different than my other work but on the other hand I quite like it and the adinkra cloth that I used in the borders and I would not mind doing more work in a similar vein. And then this year has been slow on the selling quilts front. 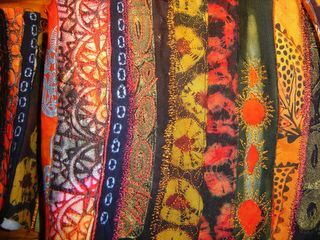 My textile pursuits are my families income- the income is derived from teaching, fabric and printed fabric sales and quilt sales. I do write articles but most of those I do not get paid for, i look upon them as free publicity in a sense, because publicity or advertising does not fit in our very tight budget- so I use my skills in this regard. I have also written a book called Tifaifai Renaissance, but really you don't earn money from writing a book and it has only added to the weight of the luggage that i carry around. 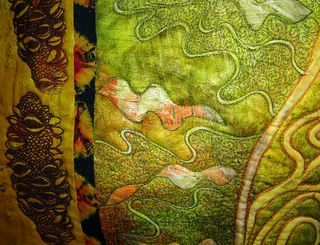 Each rejection brings with it a re-evaluation of what you are doing, where are you going, and I must admit the last week has seen me down in the doldrums- just as well I HAD to work on the Across Australia quilt- because things don't exactly look bright on the income front. How do other artists cope? . 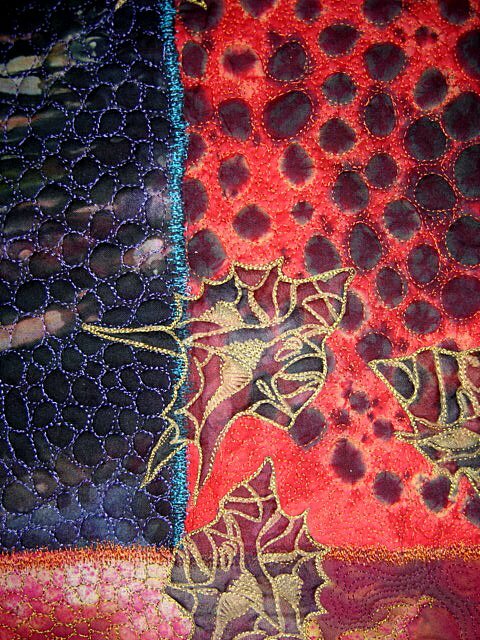 Stitched all day and still I have not finished quilting. I was hoping to have finished by now. Karen asked about polyester film- I have not seen it in Australia ( maybe someone else can enlighten us?) but I bought some in the Netherlands.It is transparent even when you have transfer dyed it, so that it allows the textures and colours of the background fabric to glimmer through. 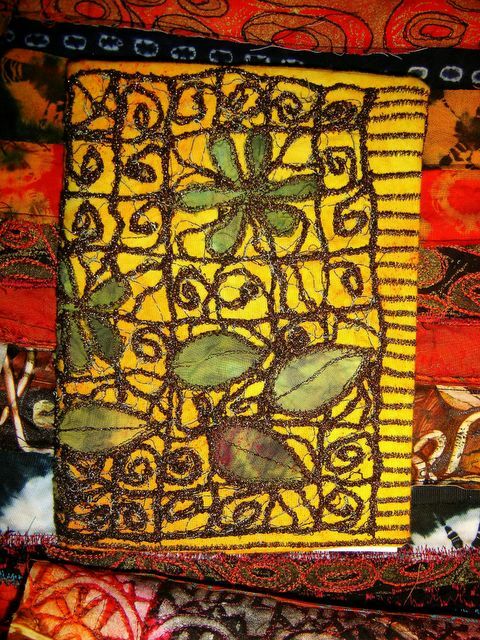 The other thing that I like about it , once stitched it has very much the appearance of a felted surface, not quite as dense but defintetly more fibrous than cotton I have used it on quite a few pieces in the last year and quite like the effect. I have assembled the quilt top and started the quilting. 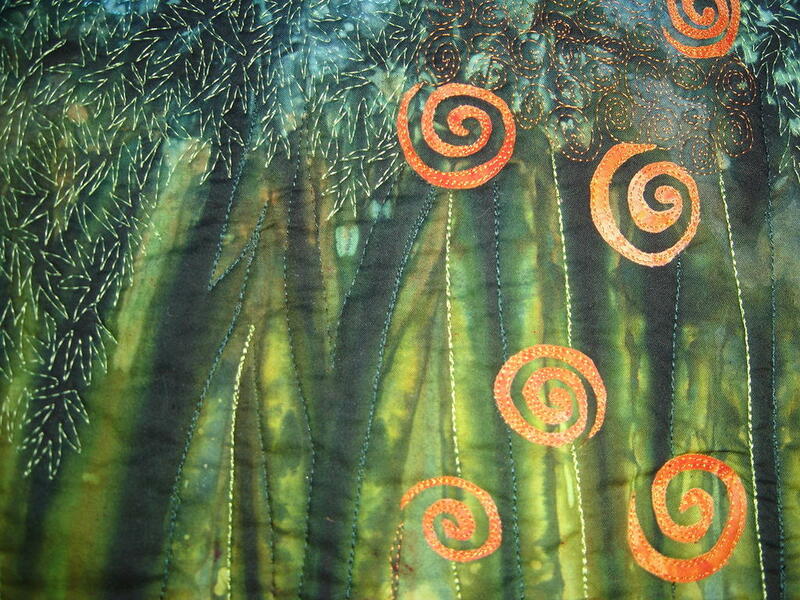 The greenish layer is polyester film which I have trimmed away to reveal the painted tree shape. 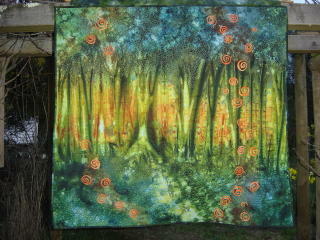 I think I am going to add another colour into the tree contour- a darker one. I expect the colour will change quite a lot depending on the colour thread I use for the quilting which will be quite heavy so that the tree will pop out. Several people asked me about Riso. It is actually Print Gocco and works in much the same way as thermofaxes- the equipment is not as expensive though the bulbs you use to expose the screens are pricey. It is a system whereby you can create small silk screens for printing- and is very handy and portable and can be used with most textile inks ( but not gutta gold as I discovered) You can also use the system to make cards and business cards. I can make screens up to A3 size but it takes a fair few bulbs to make one this size. 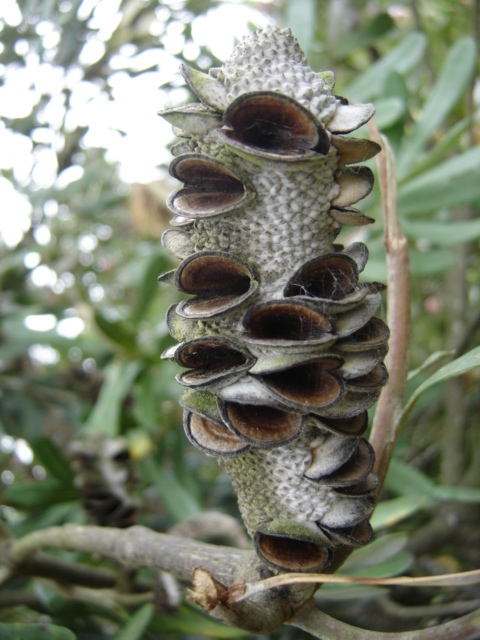 I have just printed the banksia pod of which i did the drawing and am feeling like a Happy Little Vegemite at the moment. Now the term Happy Little Vegemite is one of those Australian things that every Aussie worth his salt knows- when I went looking for a definition I stumbled upon an ANU ( Australian National University- where I once studied Arts/Law) site with lots of Australianisms- these are things that have crept into our language and are peculiarly Australian. I found lairy- a favourite word of mine, and then there is fair dinkum of course- the real thing- thought the have derived from latin somehow. 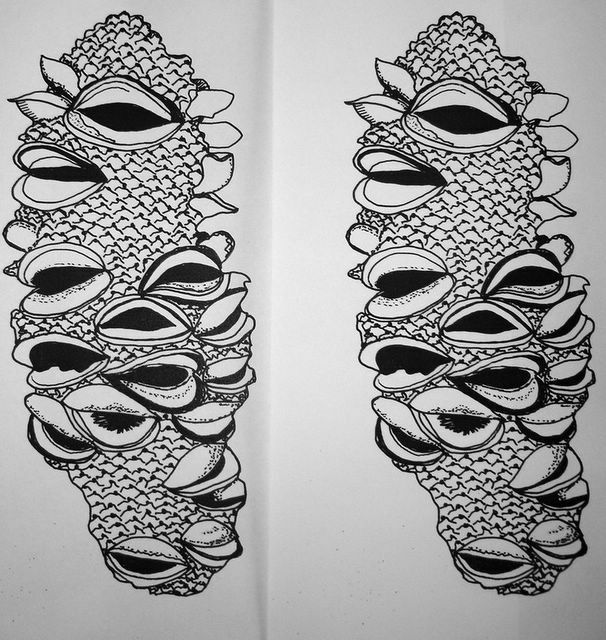 I made this drawing of the banksia pod that i photographed, so that I can make a riso screen of it and print some fabric for a quilt I am making. I kept in mind the comment made by Frances that it seemed to be having a conversation with itself- I liked that idea very much. I made this stencil a long time ago - more than 10 years ago and found it again the other day when i was looking for photos. It was inspired by a print by a Japanese master of woodcuts whose name now escapes me and I think I had borrowed the book from the library. A cat is the preferred creature of this house ( and she has bells and mirrors on her collar, to impede her hunting). Her name is Mitsou after the Rainer Maria Rilke short story that was illustrated by Balthus as a teenager( and which little books are out of my buying league), and she is a lilac burmese and a fruitcake cat , but we love her, and she us sometimes, when the heater is on inside. I decided today that i was going to change the colours of the work I was auditioning yesterday, which is one of the nice things about using a polyester film overlay- I can colour it any colour I want thereby changing the whole look. 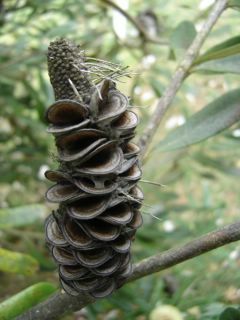 So it is going to become much greener- i also want to incorporate banksia pods- the pctures show these lovely sculptural cones. I love these flowers and pods and have many different kinds in my garden, but the cones on this particular bush are the prettiest. 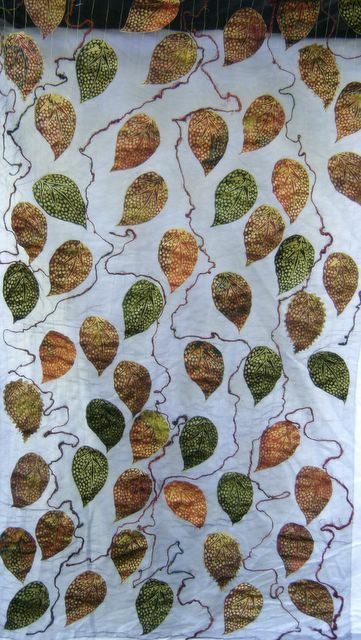 After finishing Tropical Rockpools I decided I wanted to try the technique again but with a more defined image in mind, and also to make quite a large quilt. 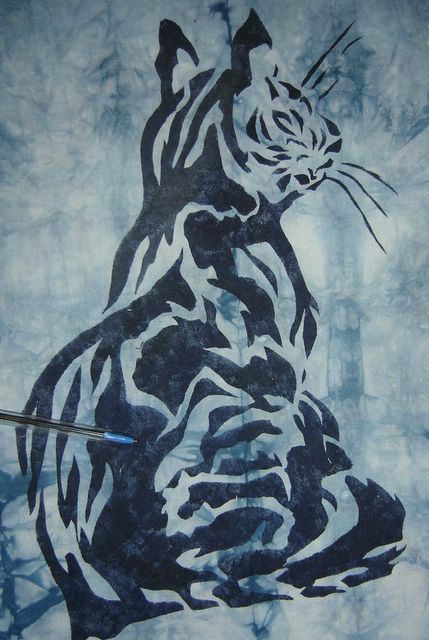 So yesterday when the weather finally decided it would be sunny I painted the cotton with the textile paints from Trapsuutjies- but che disastro I have run out of some of the paint so I couldn't make the piece as big as I had intended. So opted to make a long piece and then set it off with some transfer dyed polyester film panels. 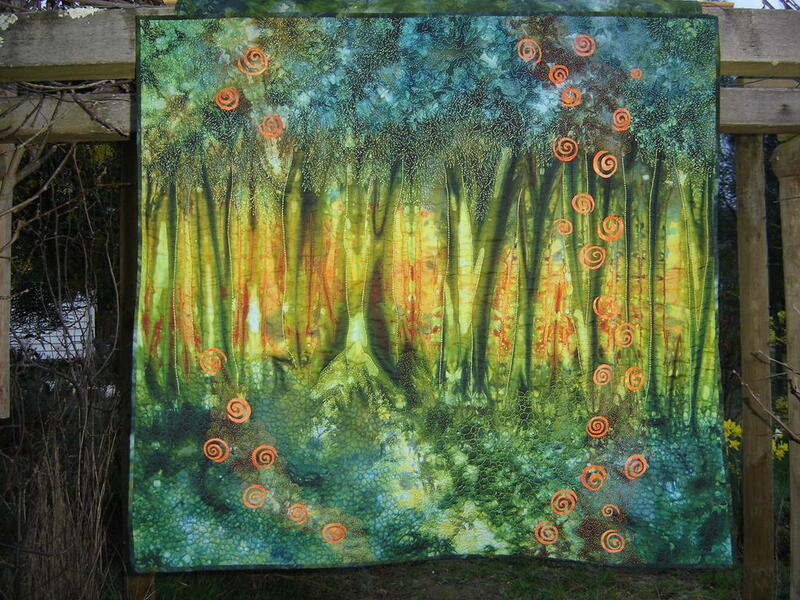 The picture above shows the background I painted on fabric and also the tree painted onto papers. 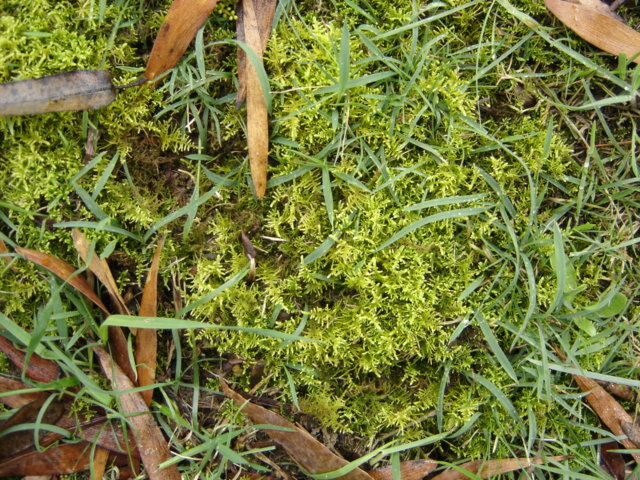 I am not sure I shall stick with this image as the picture below shows that perhaps the contrast may not work. I won't know this until tie dye some of the fabrc which I intend to use as a contrast. I have to tie all the ties tonight. 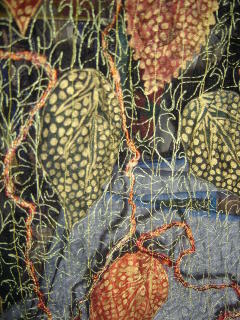 This is the piece of fabric which I painted on Saturday but now stitched and quilted. 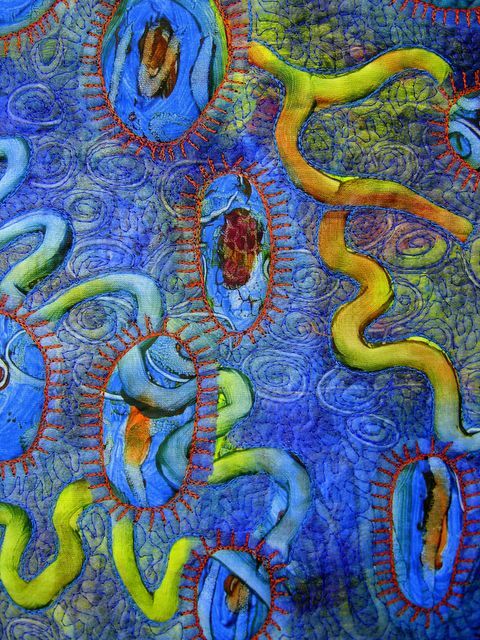 I thought the fabric was too bright and needed toning down, so I transfer dyed a piece of polyester transparent fleece in a royal blue and turquoise and laid that over the fabric and then cut away. I like the way the squiggle lines came out and will try some more of this- I have in mind doing a drawing and then cutting away and seeing what it looks like. I really need a heat press though as the iron is not the best way to transfer the dye onto the polyester fleece. I would also really like to get a hold of some 30 weight machine embroidery thread- the slightly thicker thread sits more on the surface where as the 40 weight seems to sink in more and disappear. 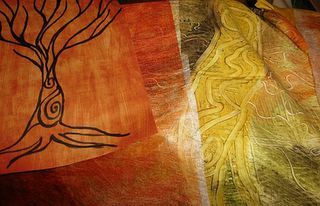 This is some fabric I painted today. 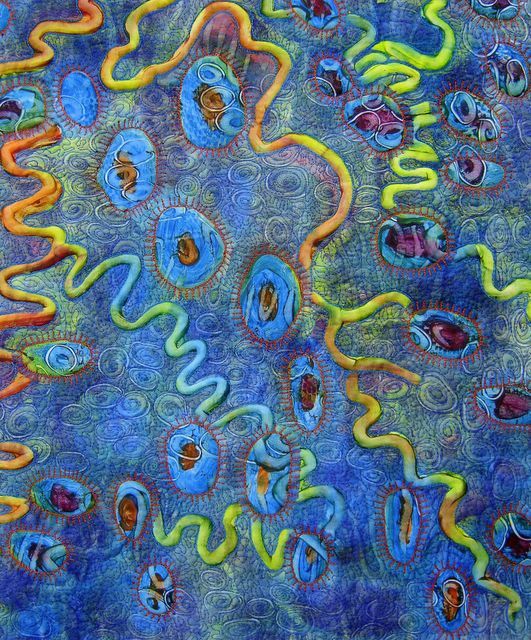 I am hoping to make a tropical rock pool type quilt with it for an exhibition I am doing with Mary Andrews an internet friend from the Fiberconnection group. I would really like to be sewing it now, but it takes about 24 hours for the fabric paint to dry. 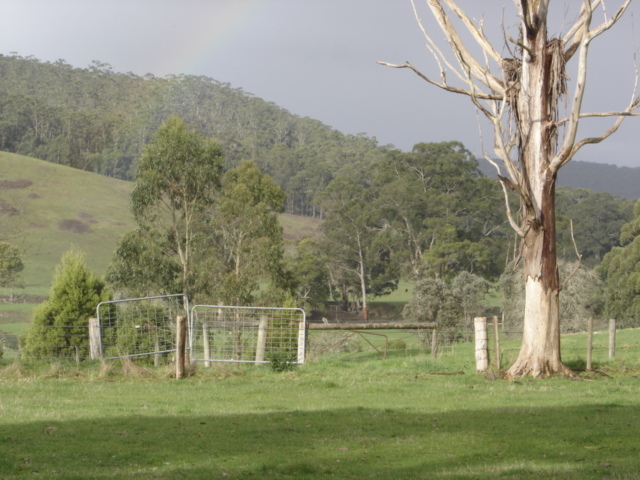 I was quite surprised to be able to photograph a rainbow in our valley today- could sure do with a pot of gold at the end of it if there were such things, as long as cheeky leprechauns don't turn up! It has been miserably cold yesterday and today , amongst the coldest days on record, and yesterday it snowed a bit further towards the coast- quite a lot of snow which is quite unusual for here. It threatened to snow where we live too but it did not happen and the power went off for four hours and as we have electric heating it was freezing, couldn't sew, not even hand sew as my hands were too cold. Today has been pretty cold too but still did not get much work done. Had to tidy one of my work tables so I can start the preparations for the catalogue for Across Australia. 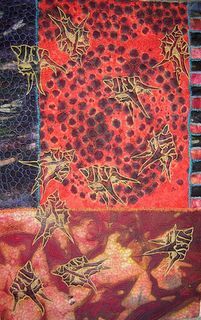 Sunday 17 September- Transfer Printing and Stitching- this class is full so I think they are going to put any further interested people into my Monday 19 September Class called Inspiration as it is possible to teach both things at the one time . So if you are interested contact the organisers via their website. Any suggestions regarding accommodation would be appreciated as my friend Sandy is coming over from England as well and I shall also have a child with me. I am also creeping towards my twenty thousanth visitor- thank you so much everyone for viewing my blog- so i thought when the twenty thousanth visitor visits ( and I don't know who you are only your server and country of origin- which I will put on my blog the next day so that you might know who you are ) I shall make you a small quilt as a thank you. As you can probably tell I did not achieve anything much creative today- did do my walk, have started rereading Malte Laurids Brigge by Rainer Maria Rilke looking at how it deals with memory and how memory pervades most objects. He wrote a rather wonderful description of The Lady and The Unicorn tapestries in the Cluny Museum in Paris- he almost brings it alive. Ohh and bindiis are sharp seed pods a bit like three cornered jacks that trap many un unwary thonged foot ( thongs here are flip flops) walking through the bush. Yesterday I felt the urge to make a small quilt out of any old fabric I grabbed off the shelf and see whether I could bring it together. It is 19 inches wide and 28 inches long and ended up depicting bindiis ( which I kind of use as a metaphor for my families migration)- as they are the overwhlemign memory of our first year in Australia. It also symbolises the 'prickly' experience of migrating, the pangs of homesickness, the strangeness and the little barbs that occur as you get used to a place and a new language. 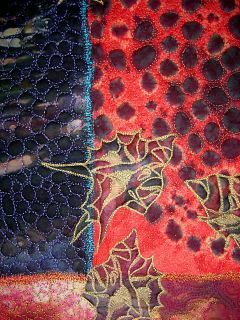 I started out with the red fabric with the black tie dyed dots. 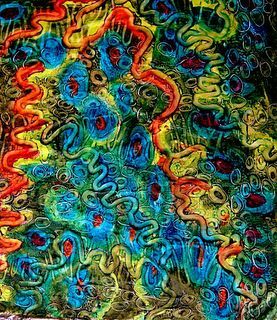 This was actually a failed piece of tie dyeing from some years ago, and I gathered the other fabrics around it. The bindiss are actually printed silk georgette that I had left over form one of my lace pieces. And a couple of days ago Amy Moreno left a note to say that she had made a link on her blog of mine. So of course I went and looked at Amy's blog and found a treasure trove of childrens books illustrators and writers including Amy's own wonderful work. So if you love children's books and other things check out her blog and website. I normally like to post pictures- but for this one Sonji Hunt has already done the job. 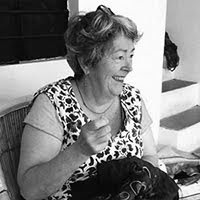 If you follow the link to her blog you will see that she has in the past few days done a review of an exhibition by Gwendolyn Magee- Blood of the Slaughtered. Like all of Sonji's visitors I was moved by GwendolynMagee's powerful and challenging work, and it has had me churning all night. 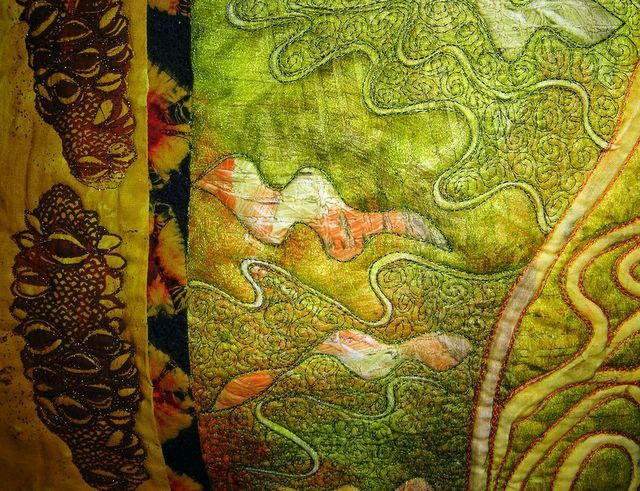 I would love to see this exhibit in the flesh.It is proof of the fact that quilts can challenge and re-educate their viewers and that indeed they are a powerful voice for injustice, identity, and memory . 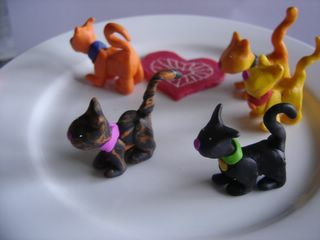 I did not do anything much creative today apart from cooking , but my middle daughter Siena made these little cats out of fimo- I just love them, and each has their own personality. As to the cooking- after last weeks curry night on Saturday we got so enthused and decided to do the same again with a couple of friends. Firstly we ( Celeste my eldest daughter and I ) made a pumpkin and orange desert. It is french out of the cook book by Stephanie Alexander called Cooking & Travelling in South West France. Stephanie Alexander is a bit of a cooking guru in Australia- and definitely is at my house too - her Cook's Companion often being used by kids and myself. But we have such an excess of pumpkins from the autumn I am trying to find ways of using them. It looks good, but we will taste it tonight and see if it worked. 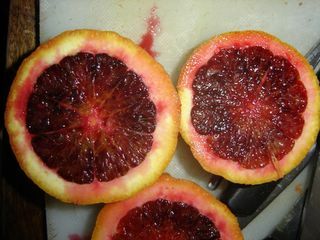 There is an orange caramel sauce dripped over the top which I made with the blood oranges from our garden. I remember blood oranges being a super special treat in winter as a child in the Netherlands as they came all the way from Spain, so of course I had to have a blood orange tree in the garden. This year the fruit is just gorgeous- aren't the colours of the oranges divine? Then we made potato omelette, as I am almost legendary ( well amongst the twenty or so people I know in Gellibrand- grin) for my potato omelette, and then a new recipe of a carrot /coconut and mustard seed salad and as I didn't have yoghurt I tried tinned coconut milk, and it tasted very nice ( another thing to do with a glut of carrots- we are trying to beat eating them as the bower birds are avaricious gluttons who burrow down into the centre of the carrot with their big beaks and eat them away). There is a trick to keeping chillies too- you just put them in a plastic container in the freezer and use them as needed, they taste like fresh chillies. Also made naan with tomato and garlic and oil toppings and a chickpea and potato curry which smells delightful, and some marinated chicken drumettes- all that should feed my horde and some extras ! I have a lot of cookbooks, I love them almost as much as textile and art books. It is good to use them now and again. 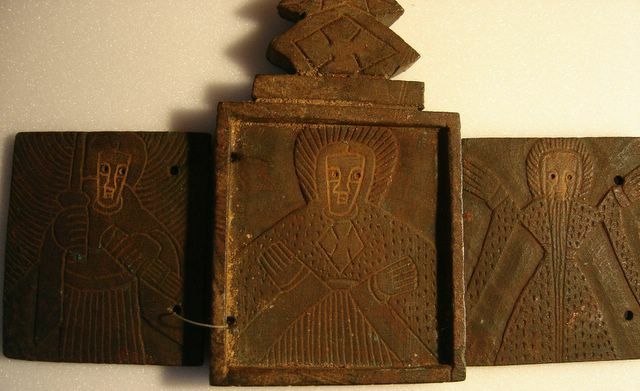 This is a photo of a little stone Coptic bible ( it is about 6 cm wide and 11 cm high) I bought in Brussels last year in an African artefact shop that had to die for kuba cloth- this was all I could afford- but who could resist such a thing? Just the whole idea of a bible being made out of stone and consisting of a total of three pages- each page carved. It dates form around the 1960's and was made in Ethiopia. It is hinged with nylon fishing line. I don't know which saints are depicted but I am sure that their depiction is stylised. I would love to print with the pages, but another part of me can't.It is actually a lovely thing to hold and gives out a sort of warmth- hard to describe really, but it feels more living than stone. The photo below is of the long and narrow piece I worked on all day. It is 24 cm wide by 165 cms long and I stitched it to within a degree of its life. This of course caused stretching, and so it doesn't hang all that straight. 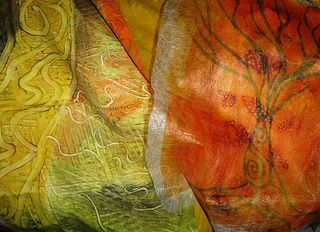 I don't know what I shall do with it, but it reminds me of prayer flags or some such thing- don't know why- perhaps it is because it is long. 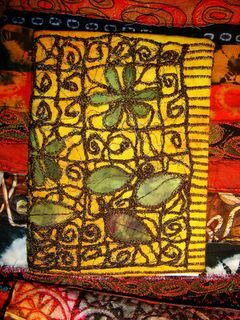 Below I have posted a picture of an journal cover I made last year with free machine stitching and fabric done onto Romeo ( which is available in England). 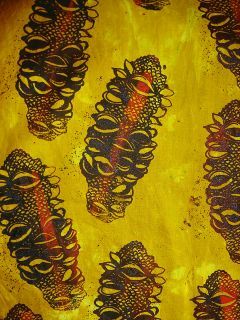 I then stitched onto the yellow hand dyed background. And it's official now - I am teaching 4 one day classes at Val d'Argent - my classes are now up on their website so here is hoping the classes fill! 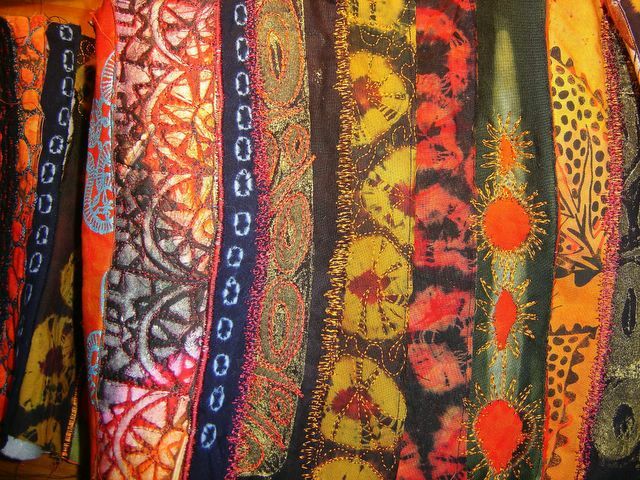 I shall be taking my hand dyed fabric to sell as well, plus th elino-cut printed panels I do. Lots of work to do before 13 September. The last couple of years I have just about missed every deadline there is to be met. I was busy with my masters and all the travelling I did, and I was involved in several travelling exhibitions so it did not leave much spare time for creating for deadlines. Since being back I have promised myself to meet as many deadlines as possible. So this leaf piece I made for the One Step Further Exhibition, which is an art quilt show here in Victoria. And I made the deadline with a day to spare!. It is not large ( I wanted it to be larger) about 80cm wide by 130 cm long- and I had a hard time photographing it and of course you can't really see that it is transparent. I had trouble sewing the straight lines- makes me wonder how I did it on the large lace pieces- there are a couple of crooked lines on this one. Today I should start on another piece.... but come on inspiration where are you?? ?